Created by Barclay’s Global Investors, iShares are exchange traded funds (ETFs) that combine the best features of stocks and mutual funds. This allows individual and corporate investors to begin an indexing program or just gain exposure to a particular segment of the market they believe is set to outperform in the future. Diversification: By purchasing iShares, you can instantly build a diversified portfolio at a fraction of the expense you would otherwise incur. By paying a single commission to your broker, you could buy the S&P 500 Index Fund (symbol: IVV). If you were to purchase each of those individual equities on your own, you would pay 500 separate commissions. Every dollar you save in expenses is an extra dollar compounding your wealth. Breadth of Options: There are numerous categories of iShares including those sorted by market capitalization, style (growth vs. value), sector/industry (basic materials, consumers services, consumer goods, energy, financial, healthcare, industrial, natural resources, technology, telecommunication, transportation, and utilities), international/regional, specialty/real estate, fixed income, and precious metals. Low Expense Ratio: iShares boasts net expense ratios between 0.03% and 0.94%. Compared to mutual fund ratios which can run twice as high, ETFs are demonstrable bargains. Tax Efficiency: iShares are based on indices such as the Dow Jones Industrial Average or the S&P 500. As a result, turnover is virtually non-existent because the underlying investments are rarely sold, seemingly eliminating annual capital gain distributions and the taxes that go with them. Liquidity: Because they are ETFs, iShares can be bought and sold throughout the trading day. You can place market, stop, and limit orders, purchase on margin, or even sell the security short. These options are simply not available for regular index funds. Who Should Not Invest in iShares? If you have large amounts of capital to invest, the low expense ratio on iShares can save you huge sums of money over the course of many years. However, for those of you who put away smaller amounts on a regular basis as part of a dollar cost averaging plan, iShares don’t make much sense. The reason: you are going to pay regular commissions to your broker each time you make a purchase. Even at a discount broker, this is likely to be around $15. For someone saving $250 per month, that’s 6 percent of principal value forever lost! In other words, for every dollar you invest only $0.94 is going to be compounding. As you learned in our discussion of the time value of money, this can result in millions of dollars in forgone wealth that you will never be able to reclaim! 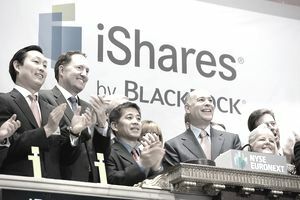 If you think iShares might be right for your portfolio, check out the official site. Why Are Leveraged ETFs Like TQQQ Not for the Average Investor?